You can edit information for user accounts in your organization's database. User accounts provide secure access to your organization's database. Each person who uses Dentrix Ascend should have his or her own user account. Note: You cannot change a user's password (even your own) from the User Accounts page. A user can change his or her password by clicking (or tapping) the Forgot Password? link on the login page and following the instructions given or, if the person is logged in, by opening the My Account page and changing the password on the Change Password tab. On the Settings menu, under Location, click (or tap) User Accounts. The User Accounts page opens. On the User Accounts page, select a user account. The options for editing the user account become available. Change the user's information, such as the user name or email address, on the following tabs as needed. User Image - A picture of the user. This picture will appear online if you are using the online booking feature. 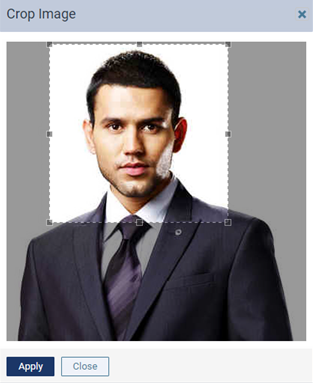 To attach a picture, click (or tap) Select Image, browse for and select the image file, crop the image as desired, and then click (or tap) Apply. Name - The first name, middle initial, and last name of the user. Username - The name that the person must use to log in. Each user in your organization must have a unique user name. Only letters and numbers are allowed; spaces and special characters are not. The maximum allowed length is 56 characters. Also, the user name cannot be "Admin" or "Administrator." Email - The email address of the user. This is used for administrative purposes and is required for every user account. Note: If you change a user's email address, Dentrix Ascend will send a verification email message to the user's original email address. That email will contain a link that the user must click (or tap) to verify that the new email address is correct. Phone 1 - The primary contact phone number of the user (for example, a home phone number). Phone 2 - The secondary contact phone number of the user (for example, a mobile phone number). Is Provider - If the user performs dental procedures (such as a general dentist or a hygienist), select Yes. Otherwise, select No. Inactivity Timeout - The length of inactivity (no interaction with the Dentrix Ascend website from your computer or device) after which Dentrix Ascend will log the user out automatically. The recommended length is 10 minutes, but there are also options for 30 minutes, 1 hour, 2 hours, 4 hours, and 8 hours. Note: If you have Dentrix Ascend open on multiple tabs of your browser at the same time, the inactivity is monitored on each tab separately. For example, if you open Dentrix Ascend on a tab and then later on another tab, continue working on the second tab, and then the first tab does not have any activity for the specified length of time, you are logged out of Dentrix Ascend automatically on that tab but can continue working on the second tab. If your organization has only one location, to change the user's rights to your location, select a different User role. A user must be assigned a role for your location. The change will not take effect until the next time the user logs in to Dentrix Ascend. 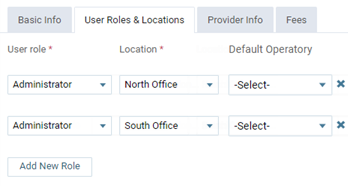 If your organization has multiple locations, to change the user's rights to a location, select a different User role for a selected Location. A user must have access to at least one location, and a user can have only one role assigned for each location. The change will not take effect until the next time the user logs in to Dentrix Ascend. 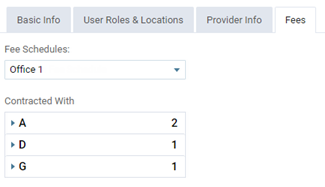 If your organization has multiple locations, to add rights for the user to access a location, click (or tap) Add New Role, and then select a user role and a location (only unassigned locations are available for selection). A user can have only one role assigned for each location. 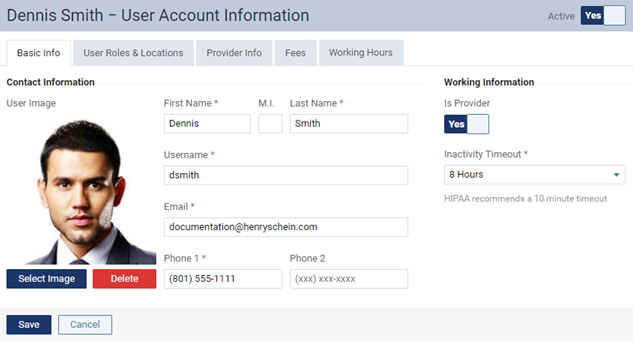 The next time the user logs in to Dentrix Ascend, he or she will be able to access the selected location, according to the specified rights of the selected user role. If your organization has multiple locations, to remove rights to a location, click (or tap) the X button next to the location that you want to remove this user's access to. 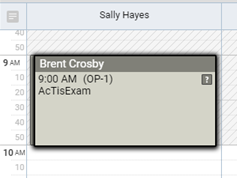 Since each user must have access to at least one location, this button is available only if there is more than one role-location combination listed. The next time the user logs in to Dentrix Ascend, he or she will not be able to access the location that was removed. Important: Your organization's business owners, doctors, and office managers should be the only ones who have administrative security roles. Short Name - An abbreviated name that will be used to identify the provider throughout Dentrix Ascend. Title - The provider's title (for example, DMD or DDS). Specialty - The provider's specialty (for example, Dentist). 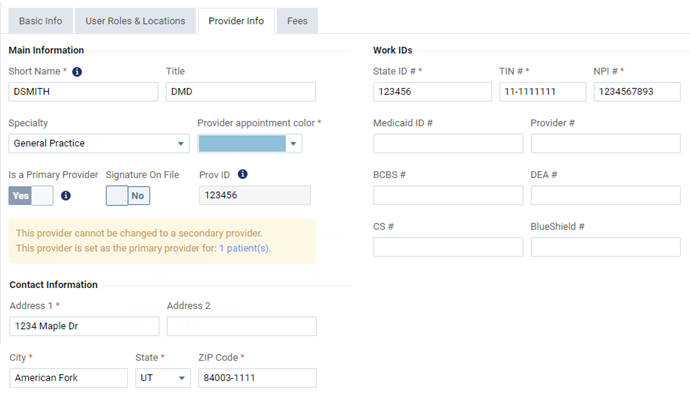 Provider Appointment Color - The color to use for appointments with this provider as the rendering provider. You can click (or tap) the color swatch to select a different color. 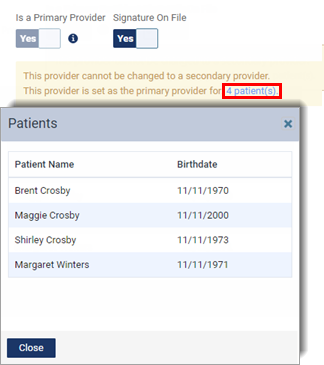 Is a Primary Provider - To allow this provider to be selected as a patient's primary provider and as a billing and/or rendering provider for claims, select Yes. Otherwise, select No. Tip: This option is not available if the provider is assigned as the primary provider for at least one patient. To view a list of the patients who have this provider as their primary provider, click (or tap) the [number of] patient(s) link in the yellow message box. Signature On File - To put a message on this provider's claims, stating that there is a signature on file for this provider, select Yes. Otherwise, select No. Contact Information - The provider's work address. Work IDs - The state ID (state license number), TIN (or SSN), NPI (for electronic claims), Medicaid ID, Provider number, Blue Cross/Blue Shield number, DEA number (for prescriptions), CS number (Controlled Substance number for Washington D.C prescriptions), and Blue Shield number of the provider. Fee Schedules - The fee schedule to use for billing patients for procedures performed by this provider. Contracted With - As needed, expand the sections (for example, A, D, and G) to view insurance carriers with names that start with those letters or numbers, and select the check boxes of the insurance carriers that this provider has a contract with to bill procedures. Important: Each time you add an insurance carrier to your organization's database, for each provider (and location serving as a provider) that is contracted with that carrier, you must return to this Contracted With section and select the check box next to that carrier's name. If your organization has multiple locations, from the Working Hours for list, select a location. For an organization with only one location, your location appears for your reference. Note: If your organization has multiple locations, the provider's working hours at other locations appear in pink with gray hatched lines for your reference. The provider's working hours at the location currently selected cannot overlap with the hours at another location. A yellow time slot indicates that the provider is available during a time when the office is open. To make the provider not available at that time, click (or tap) it. The time slot turns white. You can click (or tap) the time slot again to make it yellow. To select or clear multiple time slots at once, drag across the desired time slots. Those time slots turn yellow or white. A gray time slot with gray hatched lines indicates that the office is closed. If the provider needs to work outside of normal office hours, click (or tap) or drag across the desired time slots. Those time slots turn yellow with gray hatched lines. You can click (or tap) any of those time slots again to make them gray with gray hatched lines. To reset the provider's working hours to be that of the location's, from the Manage button menu, click (or tap) Use Location Hours. Note: If the provider's hours have never been customized, they are the same as the location's hours by default. Any changes you have made will take effect on the next day (as indicated by the red text at the top). To change when the changes will start, from the Manage button menu, click (or tap) Setup Working Hours. In the Setup Working Hours dialog box, change the Set start day, and then click (or tap) Apply. By default, the provider's working hours will repeat every week. To change the cycle, from the Manage button menu, click (or tap) Setup Working Hours. 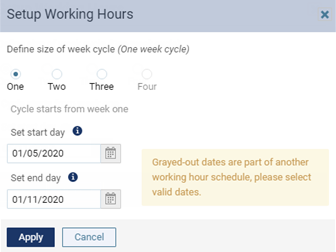 In the Setup Working Hours dialog box, select a different option under Define size of week cycle, and then click (or tap) Apply. Then, for each week in the cycle specify the provider's working hours. Use the navigation buttons in the upper-left corner to navigate between the weeks. 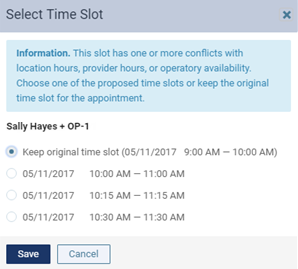 Note: If you are viewing the calendar by provider and attempt to schedule an appointment outside of the provider's working hours, the Select Time Slot dialog box will appear to allow you to keep the appointment scheduled at the original time or move it to an available time slot. To keep the appointment scheduled at the original time, click (or tap) Save. To move it to an available time slot, select one of the suggested times, and then click (or tap) Save. To allow the Select Time Slot dialog box to appear or to bypass it every time you attempt to double-book or triple-book a provider, on the Calendar page, from the View button menu, set the Warn when double-booking switch to On or Off. Once you edit a user account, the user will receive an email message stating what information for his or her user account has changed. How do you change a provider from primary to secondary?